If they could get that sensitivity with better Audio [ including Tone Adjust for music or voice – bass rolloff ] and add working SYNC and other controls for a high end portable- a great Radio could result. I wish we can get superior versions of the Tecsun PL 880 and Grundig Satellit at $200 . Great article. 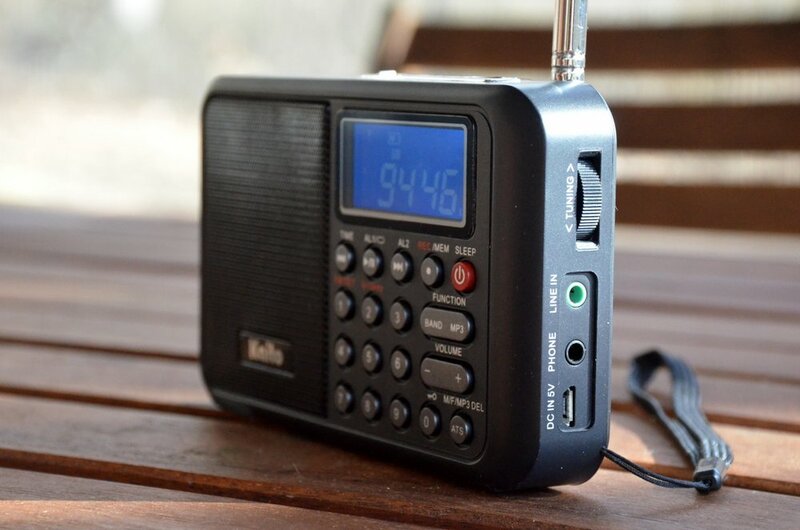 This is really a pity this good looking radio doesn’t have a better SW and AM performance, but after reading your review there are no doubts and will not buy it. I have seem some other apparently nice Chinese and Japanese small portables that were plagued with internal birdies specially in AM. Thanks for saving me not only a few euros but also to be deceived again. Have you heard of or seen the Eton’s Grundig G2 Reporter? same all-in-one category, with 2 speakers instead of one.. rather small, fits in pocket, so perhaps the speakers are weak??? I have a G2 Reporter. I got mine on eBay for $60, and Universal’s been closing them out for that price. For $60 I’m very pleased, although here in the city, the DSP circuit gets overloaded by strong MW locals, so I have to keep the antenna short for SW listening here. On N9EWO’s website I learned a GREAT trick for better battery life: in settings, change the radio from standby mode to sleep mode. MUCH better battery life when this is done! The G2 Reporter isn’t a super high performance radio, but I find it acceptable for my location, and the recording function makes it a must-have for me. My KA108 arrived this week. Your great video clips had convinced me that I could live with the AM audio, and for the most part, I can understand voice on any decent AM signal. Some treble on top would be nice, but I don’t want them to take out any of the nice thumping bass. For me the bass is a novelty in a radio this size. Having other DSP radios of this class, I knew what to expect in reception. The main nagging problem with all of mine is the severe mediumwave breakthrough across all of shortwave. This needs to be dealt with. So far I think the best radio section of a recordable radio is on the DE1121. I hope we can see a good quality SW/MW/FM recordable before much longer! ….some questions, Mr. Thomas……why is “muting” such an undesirable issue, and if it comes as a radio (dsp) design, how can we ignore it or “fix” it so as not to bother the listener? I don’t understand “soft” or “hard” mute, and how does it come into the design of the radio?….I am a novice in this field, although I have owned a few radios (Nordmende Galaxy, Sony Icf-7600)….rsvp and thanks! Muting is annoying because it makes band scanning (tuning up and down the band, listening for stations) slow and cumbersome. 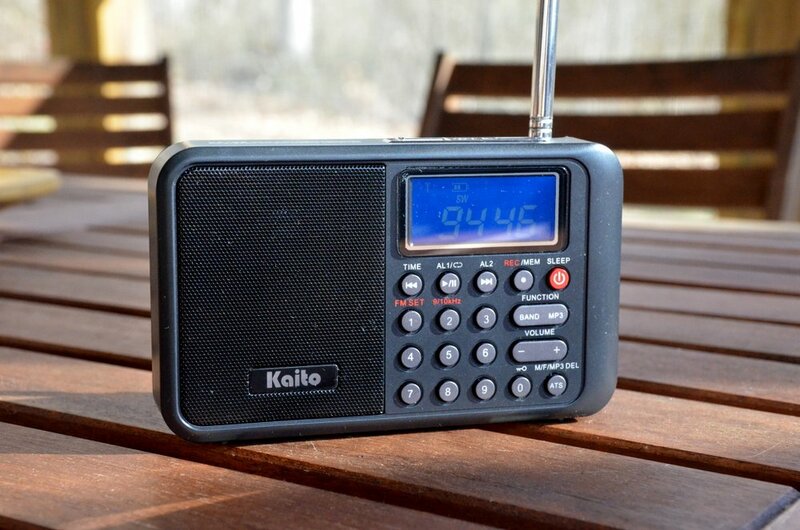 On the KA108, for example, as you tune up the band, each increment (5kHz, for example), you have to pause, wait for the audio to come back, then listen for signs of a signal. If no signal, then you move up one more step, then repeat the process. Most of the quality portables on the market either have no muting between frequency changes, of the muting period is very short. On the PL-660, for example, I can band scan very quickly because I can listen as I tune–there is not muting at all. Of course, true analog radios have no muting between frequencies either. This can most likely be fixed by Kaito through a firmware modification. I hope this helps, Mike! I am gad I waited! This baby was in my want list. I was started to see it was such a tiny baby! My Grundig traveler and Tecsun PL-606 are no-nonsense no tricks radios withoud S card functions. I needed no-nonsense work radios in the same price range. I don’t need to pay for hassles. I am awaiting one via amazon.com. However, I didn’t buy it for the radio but for its ability to play mp3 files from a USB stick. See, I rip language courses from my CDs and wanted something small/handheld with a speaker to be easily able to move around with. From your review, it seems I made a good choice for my need. The radio is of no interest to me. In fact, I wish it didn’t even have radio abilities, so it could have been cheaper. With shortwave radios like a Tecsun PL 600 and PL 680 around my place, I hardly needed a cheapo radio. Yes–for your particular application, I think you will be satisfied. I think I’m going to turn mine into a small mp3 player that simply feeds audio into my SStran AM transmitter. The battery life is pretty good (not stellar, but good). Since it doesn’t have to be plugged in, there’s no 60 cycle hum from a wall wart. I received the unit and here is my quick review. The good is the mp3 abilities. Using a USB stick with spoken word mp3s (language lessons, lectures and downloaded radio shows), this proved to be a decent unit with good sound. The handheld size made it very portable for taking onto my balcony and relaxing with a cigar while listening. I wanted a small mp3 player with a speaker and got it. The bad was the radio aspect. AM/FM is on a level with a sub $10.00 portable. For about half the price I get far superior AM/FM reception on my Sony IC38! The KA108 receives even local powerhouse stations with a little weakness. Useless. Shortwave is an absolute joke, too. For the price, I can get superior reception elsewhere. For a little more money, I can get far superior reception. While the speaker is fine on mp3s, it is horrible on the radio bands. Add too this the horrible muting problem that make you not want to actually tune but just punch in a frequency directly and you have a totally useless radio. Overall, this is an mp3 player. Under no circumstances buy this for the radio (in)abilities, or you will be very sorry. This should have been released as a stand alone portable mp3 player. 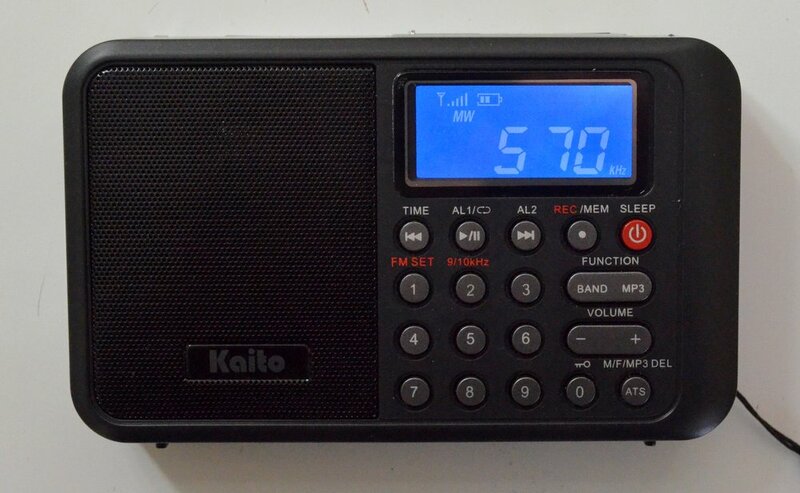 Adding the lousy radio aspect will probably cause this unit to lose sales, once the negative reviews get around. 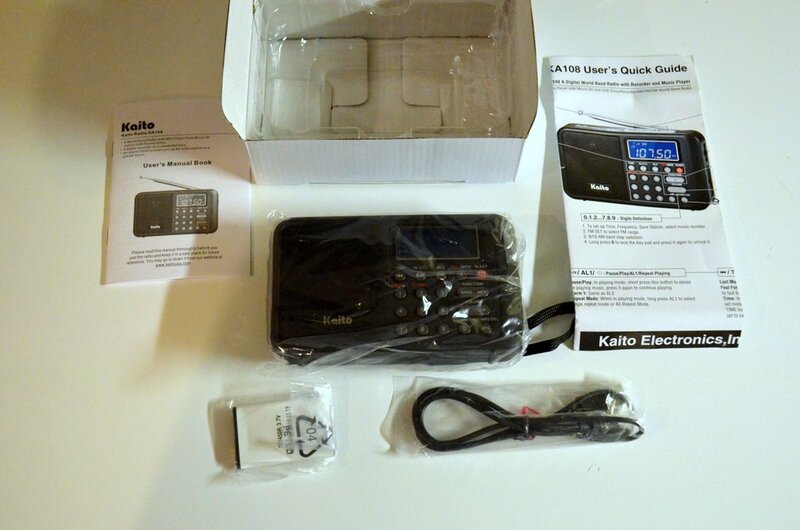 If Kaito is smart, they will redo this unit without the radio, add the ability to navigate folders and re-release it as a small but feature packed handheld mp3 player. Am I sorry I bought it? No, because it does what I wanted. There aren’t many units out there that met my needs, a small portable mp3 player with a speaker. However, I do feel it is over-priced for its one good feature. Review update: Don’t buy this unit unless you need more aggravation in your life or an expensive paperweight! 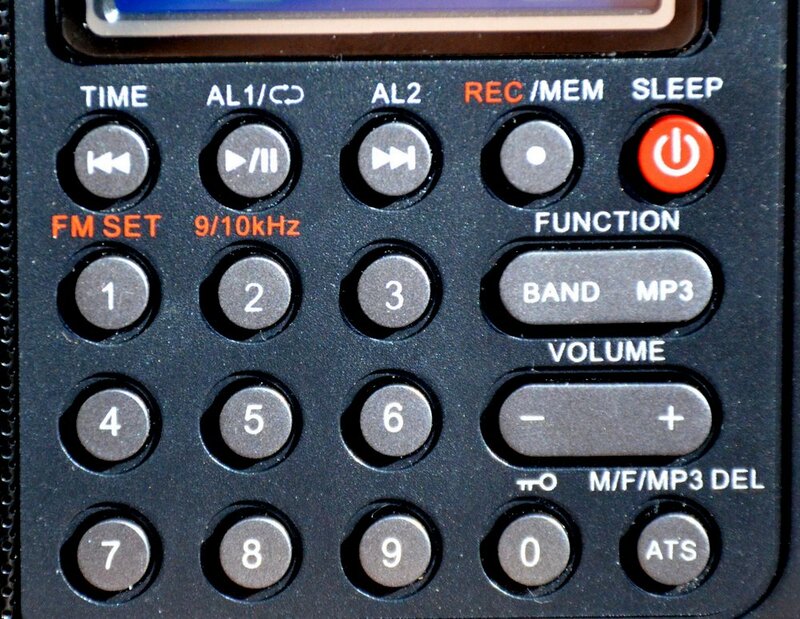 Within a couple of days of light use as an mp3 player, the unit started showing the following defect – half the time when you press the Play/Pause, FF or Rew buttons, it will send you back to the beginning of the track you were playing, regardless of which of the three buttons you press! This is particularly bad when you are ten minutes into a thirty minute language lesson or lecture. Much of the rest of the time, the FF and Rew buttons may initially work properly UNTIL you remove your finger, at which time – take a guess – they will send you back to the beginning of the track you were listening to! Anyone who has ever done audio based language lessons will know that there are times you need to pause in order to repeat a sentence or word. At other times, you will want to rewind a few seconds to listen again to something which was said. Well, with the defective buttons, you will spend more time repeatedly trying to get back to the point where you were rather than playing mp3s. I am returning this piece of trash to amazon for a refund. I don’t want another. Kaito sh9ould immediately withdraw this unit from the market, as it is a piece of junk, especially for the price. In addition, retailers like amazon and Universal should return their stock and refuse to sell it, since it has gotten such lousy overall reviews. Kaito knows what junk this is and still sent it out to the market. Shame on you, Kaito! Did you try off tuning by one or two kHz to improve the audio? As far as the off tuning doesn’t attenuate the carrier, this shouldn’t cause increased distortion, but you should get the higher tones from one or the other edge of the signal. This is an interesting proposition. If it is a standard superhet, that will work by repositioning the sideband inside the IF passband filter. If it is a digital DSP direct conversion it would not. The off tuning trick works even in the Twente WebSDR. Try to receive an AM signal using the AM-nrw setting and tune off. This has similar effect on audio quality as making the bandwidth wider. In my opinion off tuning is preferred because one can select the better sideband for listening and because it does not increase processor loading. I use the off tuning trick also in my Tecsun PL-606 dsp radio. In this way I can get rid off the soft muting in addition to the other benefits. Tuning off-frequency does help a little in some circumstances. It can improve intelligibility somewhat, but sadly the audio is still mostly muffled. Thanks for the thorough review. You confirmed my suspicions. It takes considerable skill to integrate additional microcontroller logic into a radio without drowning it in RFI. That’s the reason you can’t even find a decent external battery-powered speaker that you can connect to your radio without wiping out the incoming signal. Tecsun would be onto a winner if they integrated a recorder into their PL360/PL365 unit without compromising its reception performance. It certainly has enough room for a micro-SD card slot. Tecsun, I hope you’re listening! I’m happy that someone else has had this same problem. 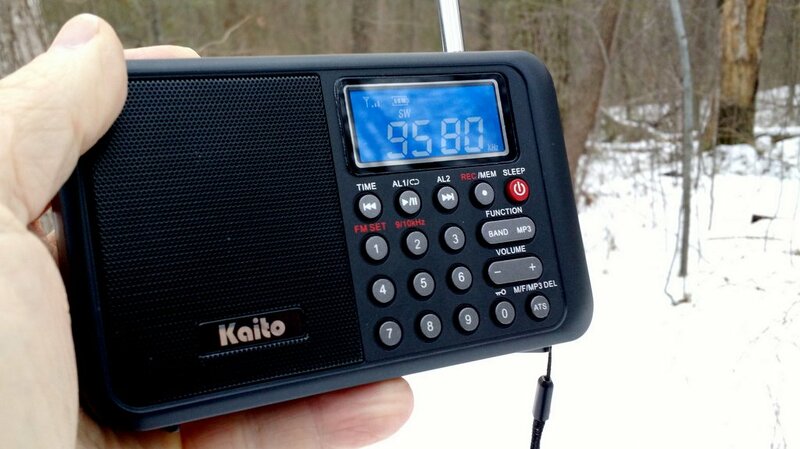 I have several portable radios which I like to take to the local mountains for FM dxing. To upgrade the sound, and make the batteries last longer, I like to connect them via 3.5mm cable to my various portable speakers. With the radios tuned in with clear sound my JBL Charge and Oontz XL will completely wipe out the incoming signal to nothing but static when plugged in. I also have some speakers that do not affect the radio output. I’ve just always wondered what the difference is. These “digital” speakers with amplifiers are QRM generating devices. I made a homemade speaker/amplifier all analog parts and I have no QRM. Thank you! I am glad this objective review sheds light on the pros and cons. You did me (and others) a great service. I do not understand why they put that mute in the tuning system, That is annoying. I have a Radio Shack DX-390. I found the mute diodes and disconnected them as well as the piezo beeper also a “peep-peep” when you push the keys.. I will pass on the Kaito. You saved me bundle for a better radio. I wish they would have a service manual. I buy the service manual first, then get a good feeling for the innards and be out only the price of the service manual. I have manuals to appliances I never purchased as well as never purchasing products they will not offer a service manual too. The mark of a good review is of course to show strengths and weaknesses – I always appreciate your reviews because you do not merely trash something, but highlight what is good. Sadly this is another example of a radio which has good intentions, but which obviously misses the mark by a fairly wide margin. Very thorough review as usual – this is why you are a trusted source of information. 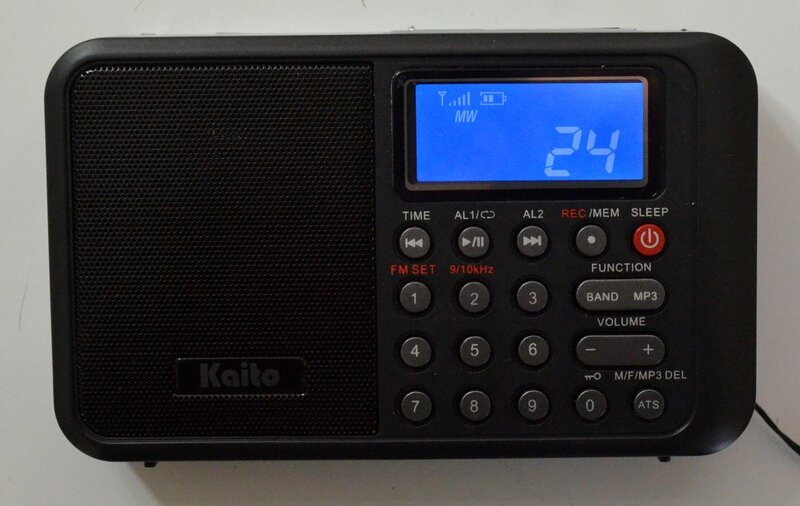 I have purchased more than one radio because of your assessments! Keep up the good work!! Excellent review, as always Thomas … much appreciated. I’m disappointed for the same reasons you are. 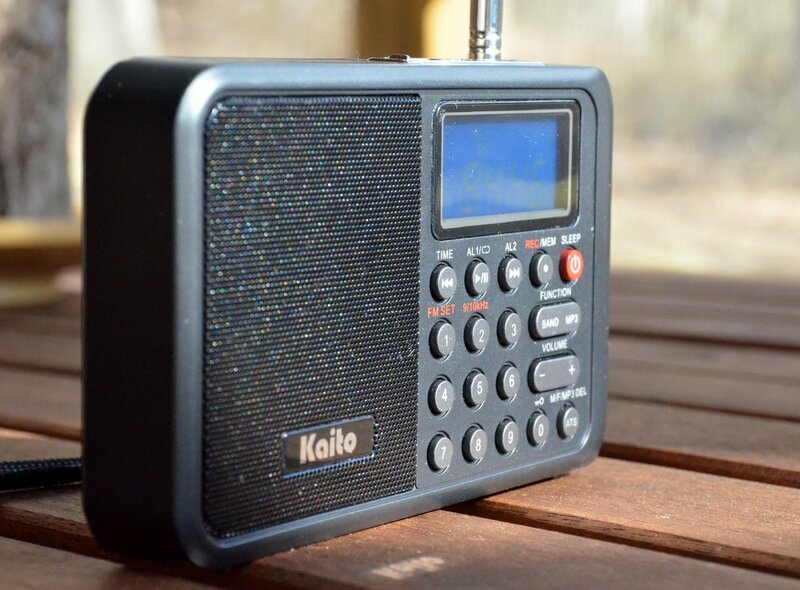 Hopefully the changes you suggested will be made by Kaito and those changes would make this one of the better small radios out there. In the mean time I’ll stay tuned to see what develops. Another excellent review. I just did a YouTube video referring to your review and your YouTube videos. Thanks for your excellent review. Thank you, Tom! And thanks for the work you put into your many fine videos!